Our secondary school students are back for holidays, though it’s not all brincadera (fun). Marieke, my predecessor, started the community service programme for all of the Nema scholars. It’s a 4 day programme, one day of training in a health related subject and 3 days of community projects involving a bit of sweat and dirt: what more could a group of teenagers wish for with no chip shop to hang out at and no booze at the “discotecha”? Saturday was training day. An enthusiastic trainer from town was found and he arrived full of beans, whilst the students arrived late (teenagers!). So, after an energiser it was down to learning about malaria; despite the prevalence of malaria in Mozambique and the effects it has on families and work output, many people still know little about it. As a killer, especially of the under 5s, in Mozambique, this is an important topic. From the cockiness of “we don’t need training” they all soon realised they do as they could not answer questions! The test at the end was, it appeared, open book so I’m hoping when I see the results it proved they concentrated. 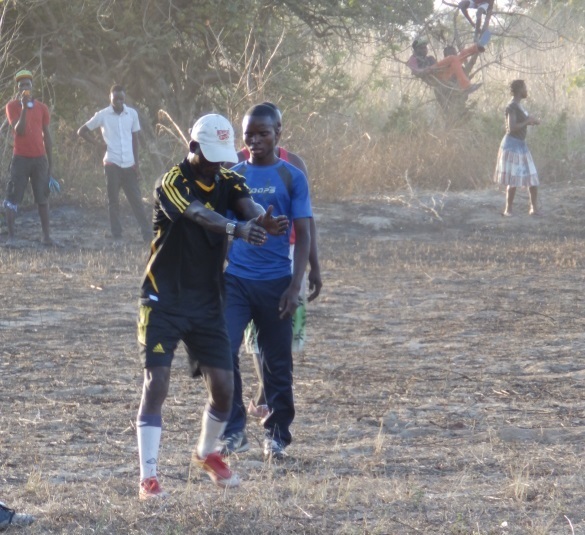 The training was followed by the long awaited Mueda vs Muagide and Macomia football game. 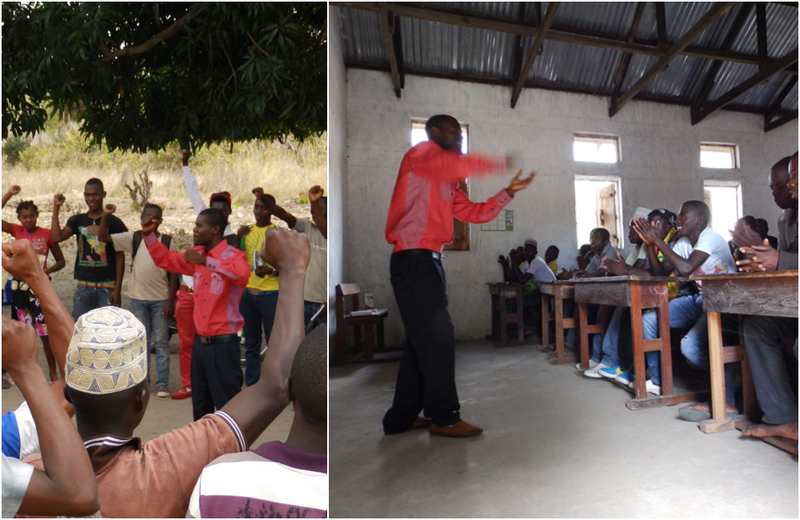 Salimo gets malaria training underway with an energiser (left) and keeps the class engaged with his enthusiasm (right). Our very own Manuel changed into his refereeing kit (somewhat to my surprise) and with his “slightly” (sarcasm for those of you who don’t know me well enough to know) over judicious use of the whistle got us underway. A 0-0 draw was reminiscent of watching Accrington Stanley with my little brother years ago, a lot of air kicks (it was hard to explain air kicks in Portuguese) and very little talent, though 10/10 for enthusiasm! Manuel really did like that whistle. The following 3 days were a series of community projects, with the 86 students broken into 4 groups. 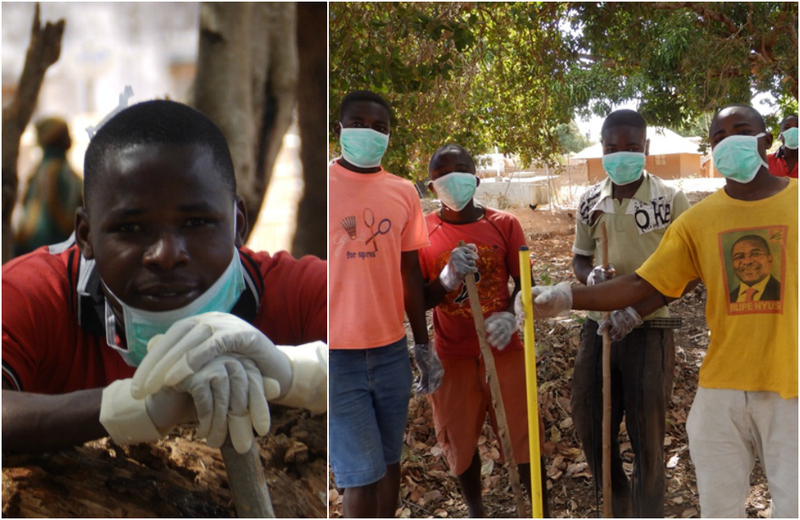 In Mucojo, the local administrative centre, we cleared the scrub and rubbish from the market and clinic areas, it’s amazing how grim it was and how much better a few days of cleaning makes it: rats and infections near maternity wards are not good, preventing that can only be a good thing. Next step is to persuade the community that keeping it clean is a good idea. Once they got into it the boys here had fun with their medical masks: the only complaint – no meninas (girls). 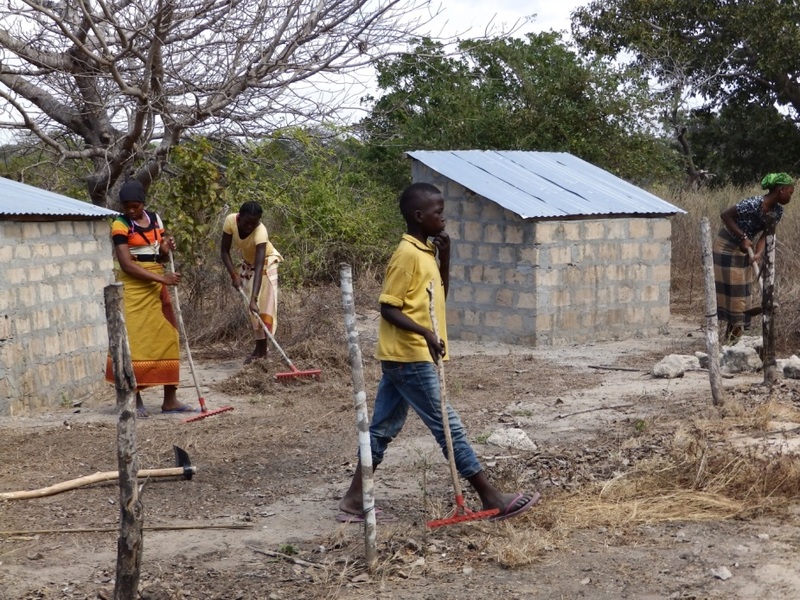 In Mipande Nema handiman Abacar had the task of marshalling his group of students through a clean-up operation at the school latrines, where the back wall had been washed away in the rains. 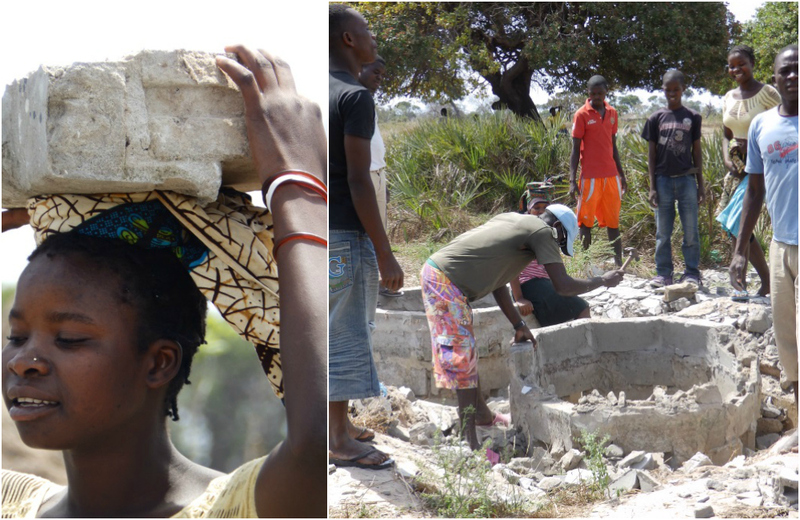 Our plan: to salvage what we could from the ruins (tin roof etc), cover in the holes for safety and sanitation and clear the area and start the construction of new latrines by getting the students to dig the hole. Abacar’s calm and gentle exterior hides his fierceness and when I arrived there on day one the guys and girls had got through a large amount of work and were working hard, having fun, of course stopping for having their photos taken and enjoying their posing. As always, the girls do the heavy work (left). Abacar (crazy shorts) removes some aggression with a hammer (right).